When I set up an alert, it never seems to fire even though the 'Test' button sends me an e-mail just fine. Once you create an alert, it must be attached it to the IP address or DNS name you want to monitor. This gives you the capability to use different alerts for different targets. To attach an alert to an IP, begin a trace to the desired host. Then, open the Alerts tab. Near the bottom of the Alerts tab, you will find your Alert Library. The Alert Library contains every alert you’ve created. By selecting the green circle next to an alert, it will add it to the current target. If you want an alert to trigger on any target you trace, you can do this by selecting the funnel icon on the desired alert. 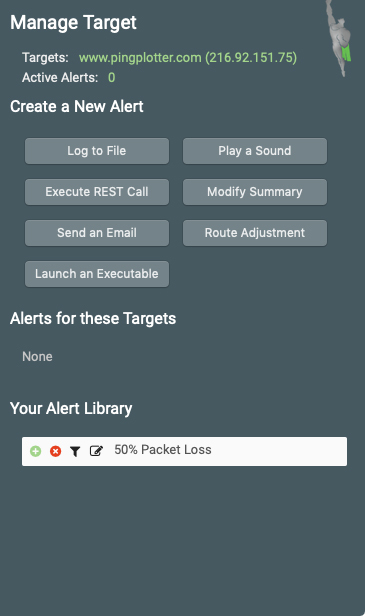 From here, you can specify the subnet range for targets you wish to trigger the alert, or enter ”ALL” to apply this alert to all traces. For a detailed explanation of alerts, see our manual section here.